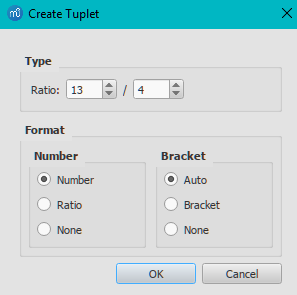 The exact method of tuplet entry depends on whether you are starting off in Note input mode or Normal mode. We'll start off with a simple example: the creation of an eighth note triplet. Ensure you are in note input mode (press N). Navigate to the note/rest (or blank measure) where you want the triplet to start (use the left/right arrow keys as required). Select a final duration for the whole triplet group. In the case of an eighth note triplet, click on the quarter note in the note input toolbar (or press 5 on the keyboard). Press the keyboard shortcut for a tuplet, Ctrl+3 (Mac: ⌘+3); alternatively, use the menu, Add→Tuplets→Triplet. This creates a triplet number/bracket and appropriately divides the original note/rest (see image above). The program automatically selects the most appropriate duration—in this example an eighth note—allowing you to immediately start entering the desired series of notes/rests. Press Ctrl+2–9 (Mac: Cmd+2–9). 2 for a duplet, 3 for a triplet etc. From the menu, select Add→Tuplets, then click on the desired option. For more complex cases, see below. Enter the desired series of notes/rests. Select the number/bracket and press Del. Direction: Auto places the bracket/number in the default position. Up always places the bracket above the note heads; Down always places the bracket below the note heads. Number type: Choice of Number, Ratio, or Nothing. Bracket type: Automatic hides the bracket for beamed notes and shows the bracket if the tuplet includes unbeamed notes or rests. Bracket displays the bracket. Nothing hides the bracket. To make fine adjustments to the way that all tuplets in the score are displayed: from the menu, select Format → Style...→Tuplets. (2) Vertical distance from stem. (3) Vertical distance from note head. (6) Distance after stem of last note.